All about chocolate fondue fountains! Home & Commercial chocolate fountain sales, chocolate fondue and recipes, chocolate fountain news and announecements, chocolate fountain rental business tips and ideas! « SEE THE SEPHRA 34″ MONTEZUMA CHOCOLATE FOUNTAIN FEATURED IN THE LATEST OLD SPICE COMMERCIAL! SOLD!!! PLEASE CONTACT US IF YOU HAVE A CHOCOLATE FOUNTAIN OR CHOCOLATE TEMPERING MACHINE TO SELL!! EXCELLENT CONDITION! THIS IS A GREAT DEAL FOR A USED COMMERCIAL CHOCOLATE FOUNTAIN (THIS MODEL IS A WORK HORSE!). The American Chocolate Fountain has created new opportunities for party and event rentals featuring chocolate fountains. This three tier medium (34″) commercial chocolate fountain will hold up to 20 lbs of chocolate and it is designed to handle any food product that can be reduced to the flowing consistency of fondue. Made in America by Buffet Enhancements, Inc.
* Versatile and ruggedly built for years of reliable commercial service. * Set up takes only minutes and operation could not be easier. * This heavy duty fountain maintains chocolate at an ideal temperature (approx 105-110°). * The upper tier unit and auger disassembles for easy cleaning. * Dishwasher safe tower assembly. * Basin capacity: 20 lbs. Now is the time to prepare for the busy chocolate fountain rental season. 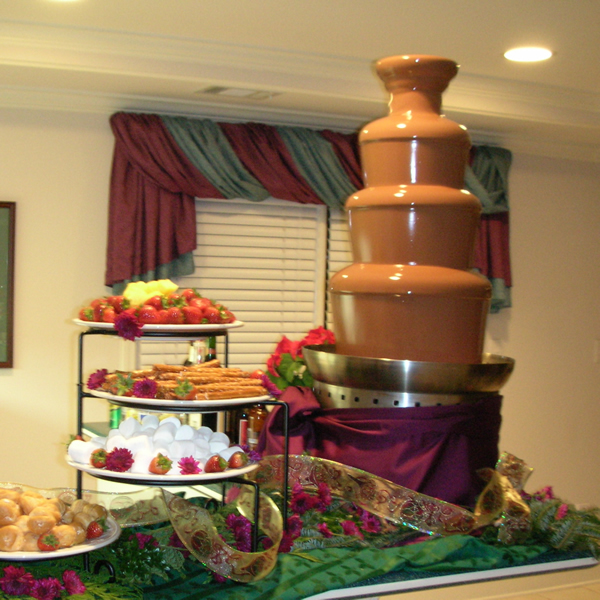 Add to your inventory of chocolate fountains or start a chocolate fountain rental business. You won’t find a better time to add the most demanded feature for weddings, parties and events - a chocolate fondue fountain by Buffet Enhancements International, Inc. CALL 1-877-313-0200 EXT 1 FOR MORE DETAILS OR CLICK HERE TO PURCHASE. This entry was posted on Tuesday, May 17th, 2011 at 11:46 am	and is filed under American Commercial Chocolate Fountains, Buffet Enhancements, Chocolate Fountain, Commercial Chocolate Fountains, Consignment, Sarah's Sweet Fountains, Special Offers! !, Used Commercial Chocolate Fountains. You can follow any responses to this entry through the RSS 2.0 feed. Both comments and pings are currently closed.